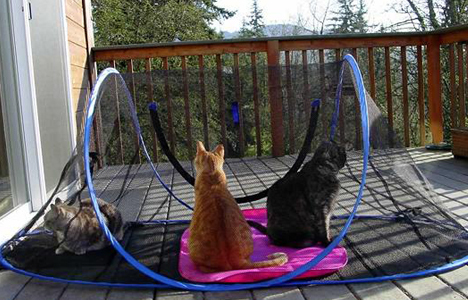 The Feline Funhouse Outdoor is a "breath of fresh air" for indoor cats and other small pets! This is a comfortable outdoor enclosure in which your indoor feline or other small pet may enjoy fresh air and sunshine. It can be placed on your deck or lawn. Also great for camping and RVing with pets! "Breath of fresh air" for indoor cats and other small pets! Great for camping and RVing with pets!